The wire bits first. Straighten out about 100mm of wire and cut off 85mm. This is easier said than done. Once you've got all six straight pieces, mark the middle with a felt tip. The plain 'U' is easy to do. Just take a 4mm drill bit and fold it round. This will give a 5mm diameter bend. This is on the right of the picture. The 'P' shaped bits are harder. 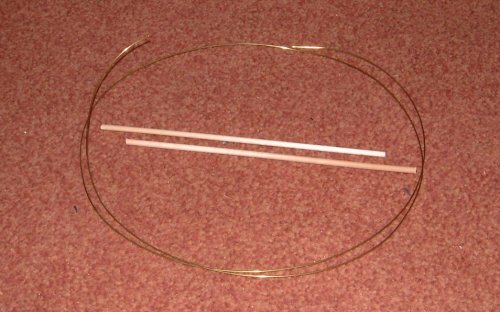 Take a 1.5mm drill and use that to make the first bend, and shown on the left. The next stage is done with a pair of fine nosed pliers. The final stage is also done with a pair of fine nosed pliers, and a lot of fiddling and cursing. There doesn't seem to be an easy way to do this. Just fiddle about till it looks right. These two pictures show the both sides of the funnels after the parts have been fitted. Actually gluing them in place is easy. 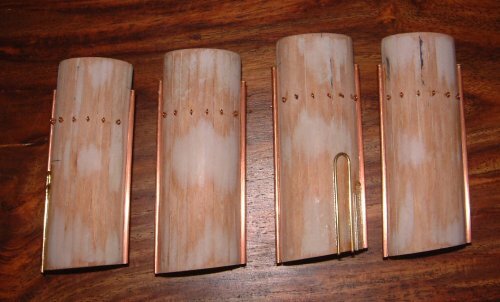 Hold each piece in the correct position, then put a tiny drop of super glue on a bit of the brass not near your finger. The glue will run under the part and hold it in place. Then run super glue all along the brass to fix it firmly in place. Wipe any excess super glue off with a cotton bud. Use the large scale plan as a guide to get the positions right. I compared the heights with the support brackets of the ladders. I then held the etched brass ladders against the funnel and marked the position of the bracket. 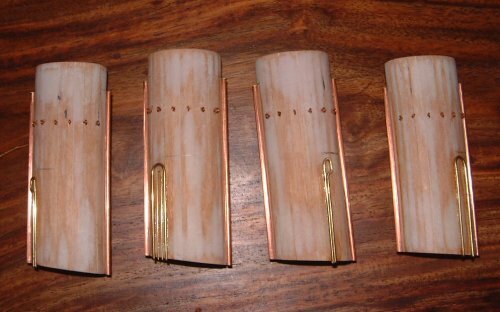 Now use that as a guide to get the height of the brass parts right. 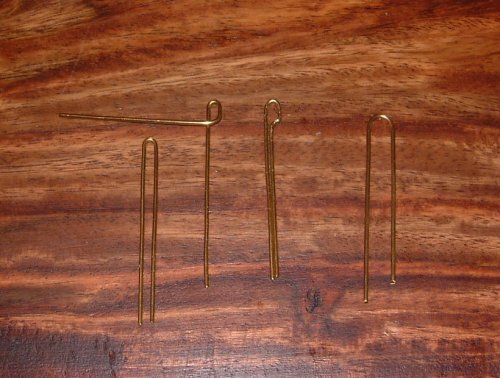 The final job was to trim off the excess brass wire with a pair of snips, file them down with a fine file, then finish off by rubbing the base of the funnel on a sheet of fine sandpaper placed on a flat surface. The mast is easy - just take some medium sandpaper and taper it evenly. Then smooth off with some fine sandpaper, and cut to length. When I'm tapering a mast I always seem to end up with the thin end a bit uneven. Therefore I always taper first, then cut to length trimming off the uneven thin end. A list of weeks which haven't been completed yet. 86 - Small panels to go in the deck once I've painted them.